"Grass" redirects here. For other uses, see Grass (disambiguation). Poaceae (/poʊˈeɪsiaɪ/) or Gramineae is a large and nearly ubiquitous family of monocotyledonous flowering plants known as grasses, commonly referred to collectively as grass. Poaceae includes the cereal grasses, bamboos and the grasses of natural grassland and cultivated lawns and pasture. Grasses have stems that are hollow except at the nodes and narrow alternate leaves borne in two ranks. The lower part of each leaf encloses the stem, forming a leaf-sheath. With around 780 genera and around 12,000 species, Poaceae are the fifth-largest plant family, following the Asteraceae, Orchidaceae, Fabaceae and Rubiaceae. Grasslands such as savannah and prairie where grasses are dominant are estimated to constitute 40.5% of the land area of the Earth, excluding Greenland and Antarctica. Grasses are also an important part of the vegetation in many other habitats, including wetlands, forests and tundra. The Poaceae are the most economically important plant family, providing staple foods from domesticated cereal crops such as maize, wheat, rice, barley, and millet as well as forage, building materials (bamboo, thatch, straw) and fuel (ethanol). Though they are commonly called "grasses", seagrasses, rushes, and sedges fall outside this family. The rushes and sedges are related to the Poaceae, being members of the order Poales, but the seagrasses are members of order Alismatales. The name Poaceae was given by John Hendley Barnhart in 1895,:7 based on the tribe Poeae described in 1814 by Robert Brown, and the type genus Poa described in 1753 by Carl Linnaeus. The term is derived from the Ancient Greek πόα (póa, "fodder"). Grasses include some of the most versatile plant life-forms. They became widespread toward the end of the Cretaceous period, and fossilized dinosaur dung (coprolites) have been found containing phytoliths of a variety that include grasses that are related to modern rice and bamboo. Grasses have adapted to conditions in lush rain forests, dry deserts, cold mountains and even intertidal habitats, and are currently the most widespread plant type; grass is a valuable source of food and energy for all sorts of wildlife and organics. Before 2005, fossil findings indicated that grasses evolved around 55 million years ago. Recent findings of grass-like phytoliths in Cretaceous dinosaur coprolites have pushed this date back to 66 million years ago. In 2011, revised dating of the origins of the rice tribe Oryzeae suggested a date as early as 107 to 129 Mya. The relationships among the three subfamilies Bambusoideae, Oryzoideae and Pooideae in the BOP clade have been resolved: Bambusoideae and Pooideae are more closely related to each other than to Oryzoideae. This separation occurred within the relatively short time span of about 4 million years. According to Lester Charles King the spread of grasses in the Late Cenozoic would have changed patterns of hillslope evolution favouring slopes that are convex upslope and concave downslope and lacking a free face were common. King argued that this was the result of more slowly acting surface wash caused by carpets of grass which in turn would have resulted in relatively more soil creep. Diagram of a typical lawn grass plant. Three general classifications of growth habit present in grasses: bunch-type (also called caespitose), stoloniferous, and rhizomatous. The success of the grasses lies in part in their morphology and growth processes and in part in their physiological diversity. Most of the grasses divide into two physiological groups, using the C3 and C4 photosynthetic pathways for carbon fixation. The C4 grasses have a photosynthetic pathway, linked to specialized Kranz leaf anatomy, which allows for increased water use efficiency, rendering them better adapted to hot, arid environments and those lacking in carbon dioxide. Perennial warm-season - big bluestem, Indiangrass, Bermudagrass and switchgrass. The grass family is one of the most widely distributed and abundant groups of plants on Earth. Grasses are found on every continent, including Antarctica with the presence of Antarctic hair grass on the Antarctic Peninsula. Grasses are the dominant vegetation in many habitats, including grassland, salt-marsh, reedswamp and steppes. They also occur as a smaller part of the vegetation in almost every other terrestrial habitat. Grass-dominated biomes are called grasslands. If only large, contiguous areas of grasslands are counted, these biomes cover 31% of the planet's land. Grasslands include pampas, steppes, and prairies. Grasses provide food to many grazing mammals—such as livestock, deer, and elephants—as well as to many species of butterflies and moths. Many types of animals eat grass as their main source of food, and are called graminivores – these include cattle, sheep, horses, rabbits and many invertebrates, such as grasshoppers and the caterpillars of many brown butterflies. Grasses are also eaten by omnivorous or even occasionally by primarily carnivorous animals. There are about 12,000 grass species in about 771 genera that are classified into 12 subfamilies. See the full list of Poaceae genera. Grasses are, in human terms, perhaps the most economically important plant family. Their economic importance stems from several areas, including food production, industry, and lawns. They have been grown as food for domesticated animals for up to 6,000 years and the grains of grasses such as wheat, rice, maize (corn) and barley have been the most important human food crops. Grasses are also used in the manufacture of thatch, paper, fuel, clothing, insulation, timber for fencing, furniture, scaffolding and construction materials, floor matting, sports turf and baskets. Grazing cattle on a pasture near Hradec nad Moravicí in Czech Silesia. Agricultural grasses grown for their edible seeds are called cereals or grains (although the latter term, agriculturally, refers to both cereals and legumes). Of all crops grown, 70% are grasses. Three cereals—rice, wheat, and maize (corn)—provide more than half of all calories consumed by humans. Cereals constitute the major source of carbohydrates for humans and perhaps the major source of protein, including rice (in southern and eastern Asia), maize (in Central and South America), and wheat and barley (in Europe, northern Asia and the Americas). Sugarcane is the major source of sugar production. Additional food uses of sugarcane include sprouted grain, shoots, and rhizomes, and in drink they include sugarcane juice and plant milk, as well as rum, beer, whisky, and vodka. Lemongrass is a grass used as a culinary herb for its citrus-like flavor and scent. Many species of grass are grown as pasture for foraging or as fodder for prescribed livestock feeds, particularly in the case of cattle, horses, and sheep. Such grasses may be cut and stored for later feeding, especially for the winter, in the form of bales of hay or straw, or in silos as silage. Straw (and sometimes hay) may also be used as bedding for animals. Grasses are used as raw material for a multitude of purposes, including construction and in the composition of building materials such as cob, for insulation, in the manufacture of paper and board such as Oriented structural straw board. Grass fiber can be used for making paper, and for biofuel production.Bamboo scaffolding is able to withstand typhoon-force winds that would break steel scaffolding. Larger bamboos and Arundo donax have stout culms that can be used in a manner similar to timber, Arundo is used to make reeds for woodwind instruments, and bamboo is used for innumerable implements. Grasses are the primary plant used in lawns, which themselves derive from grazed grasslands in Europe. They also provide an important means of erosion control (e.g., along roadsides), especially on sloping land. Grass lawns are an important covering of playing surfaces in many sports, including football (soccer), American football, tennis, golf, cricket, softball and baseball. Ornamental grasses, such as perennial bunch grasses, are used in many styles of garden design for their foliage, inflorescences, seed heads. They are often used in natural landscaping, xeriscaping and slope stabilization in contemporary landscaping, wildlife gardening, and native plant gardening. Forms of grass are used to cover baseball fields, like this one in Citi Field, home of the New York Mets. Grass playing fields, courses and pitches are the traditional playing surfaces for many sports, including American football, association football, baseball, cricket, golf, and rugby. Grass surfaces are also sometimes used for horse racing and tennis. Type of maintenance and species of grass used may be important factors for some sports, less critical for others. In some sports facilities, including indoor domes and other places where maintenance of a grass field would be difficult, grass may be replaced with artificial turf, a synthetic grass-like substitute. The gray area is the cricket pitch currently in use. 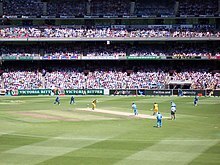 Parallel to it are other pitches in various states of preparation which could be used in other matches. In cricket, the pitch is the strip of carefully mowed and rolled grass where the bowler bowls. In the days leading up to the match it is repeatedly mowed and rolled to produce a very hard, flat surface for the ball to bounce off. Grass on golf courses is kept in three distinct conditions: that of the rough, the fairway, and the putting green. Grass on the fairway is mown short and even, allowing the player to strike the ball cleanly. Playing from the rough is a disadvantage because the long grass may affect the flight of the ball. Grass on the putting green is the shortest and most even, ideally allowing the ball to roll smoothly over the surface. An entire industry revolves around the development and marketing of grass varieties for golf courses. In tennis, grass is grown on very hard-packed soil, and the bounce of a tennis ball may vary depending on the grass's health, how recently it has been mowed, and the wear and tear of recent play. The surface is softer than hard courts and clay (other tennis surfaces), so the ball bounces lower, and players must reach the ball faster resulting in a different style of play which may suit some players more than others. Among the world's most prestigious court for grass tennis is Centre Court at Wimbledon, London which hosts the final of the annual Wimbledon Championships in England, one of the four Grand Slam tournaments. Grasses have long had significance in human society. They have been cultivated as feed for people and domesticated animals for thousands of years. The primary ingredient of beer is usually barley or wheat, both of which have been used for this purpose for over 4,000 years. ...the desire for upward mobility and its manifestation in the lawn. As Virginia Jenkins, author of The Lawn, put it quite bluntly, 'Upper middle-class Americans emulated aristocratic society with their own small, semi-rural estates.' In general, the lawn was one of the primary selling points of these new suburban homes, as it shifted social class designations from the equity and ubiquity of urban homes connected to the streets with the upper-middle class designation of a "healthy" green space and the status symbol that is the front lawn. Many US municipalities and homeowners' associations have rules which require lawns to be maintained to certain specifications, sanctioning those who allow the grass to grow too long. In communities with drought problems, watering of lawns may be restricted to certain times of day or days of the week. The smell of the freshly cut grass is produced mainly by cis-3-Hexenal. "The grass is always greener on the other side" suggests an alternate state of affairs will always seem preferable to one's own. "Don't let the grass grow under your feet" tells someone to get moving. "A snake in the grass" means dangers that are hidden. "When elephants fight, it is the grass which suffers" tells of bystanders caught in the crossfire. A folk myth about grass is that it refuses to grow where any violent death has occurred. In John Christopher's The Death of Grass (1956, published in the United States as No Blade of Grass), a plague that kills off all forms of grass threatens the survival of the human species. In Ward Moore's 1947 novel Greener Than You Think, the world is slowly taken over by unstoppable Bermuda Grass. Alice Munro's story "Save the Reaper" (1998) contains an important allusion to the idiomatic saying, "To hear the grass grow"; the aging protagonist remembers her grandfather's telling her when she was young that "at night you could hear the corn growing" in the region where the story is set. The protagonist hears the grass grow in ways that are central to the story's significance on the topic of retelling, or rather, in an act of self-censorship, of leaving untold certain experiences of the recent past. 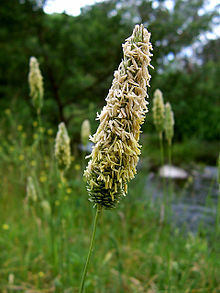 A grass flower head (meadow foxtail) showing the plain-coloured flowers with large anthers. ^ a b Yan Wu; Hai-Lu You; Xiao-Qiang Li (2018). "Dinosaur-associated Poaceae epidermis and phytoliths from the Early Cretaceous of China". National Science Review. 5 (5): 721–727. doi:10.1093/nsr/nwx145. ^ Angiosperm Phylogeny Group (2009). "An update of the Angiosperm Phylogeny Group classification for the orders and families of flowering plants: APG III". Botanical Journal of the Linnean Society. 161 (2): 105–121. doi:10.1111/j.1095-8339.2009.00996.x. Archived from the original (PDF) on 2017-05-25. Retrieved 2013-06-26. ^ HASTON, ELSPETH; RICHARDSON, JAMES E.; STEVENS, PETER F.; CHASE, MARK W.; HARRIS, DAVID J. (October 2009). "The Linear Angiosperm Phylogeny Group (LAPG) III: a linear sequence of the families in APG III". Botanical Journal of the Linnean Society. 161 (2): 128–131. doi:10.1111/j.1095-8339.2009.01000.x. ^ Christenhusz, M.J.M. ; Byng, J.W. (2016). "The number of known plants species in the world and its annual increase". Phytotaxa. 261 (3): 201–217. doi:10.11646/phytotaxa.261.3.1. Archived from the original on 2016-07-29. ^ "Angiosperm Phylogeny Website". Archived from the original on 23 March 2016. Retrieved 20 March 2016. ^ Reynolds, S.G. "Grassland of the world". www.fao.org. Archived from the original on 2016-09-20. Retrieved 2016-10-04. ^ Barnhart, John Hendley (15 January 1895). "Family nomenclature". Bulletin of the Torrey Botanical Club. 22 (1): 1–24. Retrieved 5 June 2016. ^ Piperno, Dolores R.; Sues, Hans-Dieter (18 November 2005). "Dinosaurs Dined on Grass". Science. 310 (5751): 1126–1128. doi:10.1126/science.1121020. PMID 16293745. ^ Grass Phylogeny Working Group II (2012). "New grass phylogeny resolves deep evolutionary relationships and discovers C4 origins". New Phytologist. 193 (2): 304–312. doi:10.1111/j.1469-8137.2011.03972.x. PMID 22115274. ^ Piperno, Dolores R.; Sues, Hans-Dieter (2005). "Dinosaurs Dined on Grass". Science. 310 (5751): 1126–8. doi:10.1126/science.1121020. PMID 16293745. ^ Prasad, V.; Stroemberg, C.A.E. ; Alimohammadian, H.; Sahni, A. (2005). "Dinosaur coprolites and the early evolution of grasses and grazers". Science. 310 (5751): 1177–1180. doi:10.1126/science.1118806. PMID 16293759. ^ Prasad, V.; Strömberg, C.A. ; Leaché, A.D.; Samant, B.; Patnaik, R.; Tang, L.; Mohabey, D.M. ; Ge, S.; Sahni, A. (2011). "Late Cretaceous origin of the rice tribe provides evidence for early diversification in Poaceae". Nature Communications. 2: 480. doi:10.1038/ncomms1482. PMID 21934664. ^ Wu, Z.Q. ; Ge, S. (2012). "The phylogeny of the BEP clade in grasses revisited: Evidence from the whole-genome sequences of chloroplasts". Molecular Phylogenetics and Evolution. 62 (1): 573–578. doi:10.1016/j.ympev.2011.10.019. PMID 22093967. ^ King, L.C. (1953). "Canons of landscape evolution". Geological Society of America Bulletin. 64 (7): 721–752. ^ a b c d e f g h i j k Cope, T.; Gray, A. (2009). Grasses of the British Isles. London, U.K.: Botanical Society of Britain and Ireland. ISBN 9780901158420. ^ Clayton, W.D. ; Renvoise, S.A. (1986). Genera Graminum: Grasses of the world. London: Royal Botanic Garden, Kew. ISBN 9781900347754. ^ "Insect Pollination of Grasses". Australian Journal of Entomology. 3: 74. 1964. doi:10.1111/j.1440-6055.1964.tb00625.x. ^ a b Attenborough, David (1984). The Living Planet. British Broadcasting Corporation. ISBN 978-0-563-20207-3. ^ Sarandón, Ramiro (1988). "Biología poblacional del gramon (Cynodon spp., Gramineae)": 189. Archived from the original on 11 September 2014. Retrieved 22 April 2014. ^ "Angiosperm phylogeny website". Archived from the original on 2010-02-06. Retrieved 2007-10-07. ^ a b George Constable, ed. (1985). Grasslands and Tundra. Planet Earth. Time Life Books. p. 20. ISBN 978-0-8094-4520-2. ^ Lambert, David (2006). The Field Guide to Geology. Infobase Publishing. ISBN 9781438130057. Archived from the original on 2018-01-10. ^ "Chapter 1: How grasses grow". Farmwest.com. Archived from the original on 2013-09-10. Retrieved 2013-08-26. ^ Soreng, Robert J.; Peterson, Paul M.; Romschenko, Konstantin; Davidse, Gerrit; Zuloaga, Fernando O.; Judziewicz, Emmet J.; Filgueiras, Tarciso S.; Davis, Jerrold I.; Morrone, Osvaldo (2015). "A worldwide phylogenetic classification of the Poaceae (Gramineae)". Journal of Systematics and Evolution. 53 (2): 117–137. doi:10.1111/jse.12150. ISSN 1674-4918. ^ George Constable, ed. (1985). Grasslands and Tundra. Planet Earth. Time Life Books. p. 19. ISBN 978-0-8094-4520-2. ^ Raven, P.H. ; Johnson, G.B. (1995). Carol J. Mills, ed. Understanding Biology (3rd ed.). WM C. Brown. p. 536. ISBN 978-0-697-22213-8. ^ Tainton, Neil; van Deventer, Pietr. "Cricket pitches Principles and practice of pitch preparation". cricinfo. Archived from the original on 2017-06-09. ^ Matthew J. Lindstrom, Hugh Bartling, Suburban sprawl: culture, theory, and politics (2003), p. 72, quoting Virginia Scott Jenkins, The Lawn: A History of an American Obsession (1994), p.21. ^ Paul Robbins and Julie T. Sharp, "Producing and Consuming Chemicals: The Moral Economy of the American Lawn", Economic Geography 79:4 (2003), p. 425-45; reprinted in William G. Moseley, David A. Lanegran, Kavita Pandit, The Introductory Reader in Human Geography Archived 2016-06-28 at the Wayback Machine (2007), p. 323-36. ^ "Lawn Sprinkling Regulations in Metro Vancouver, BC, Canada". Metrovancouver.org. 2011-02-21. Archived from the original on 2012-01-19. Retrieved 2013-08-26. ^ "hexenal". School of Chemistry, University of Bristol. Archived from the original on 2013-10-09. Retrieved 2013-08-26. ^ Olmert, Michael (1996). Milton's Teeth and Ovid's Umbrella: Curiouser & Curiouser Adventures in History, p. 208. Simon & Schuster, New York. ISBN 0-684-80164-7. ^ For publication details of "Save the Reaper" by Alice Munro see List of short stories by Alice Munro. ^ Miller, Judith Maclean (Spring 2002). "Deconstructing Silence: The Mystery of Alice Munro". Antigonish Review (129). pp. 43–52. Wikimedia Commons has media related to Grass. Need a Definition of Grass?